I hear there is a House Democratic Representative who is against SB5. I would like to remind that Democratic lawmaker that standing for the reproductive freedom of all Delawareans is one of the foundational load-bearing beams supporting the house that is the Democratic Party. To vote against SB5 means you are not a progressive, not a liberal, and not a Democrat. If this representative does vote against SB5 on the floor of the House, I will make it my mission in life to defeat him or her in the coming primaries in 2018. 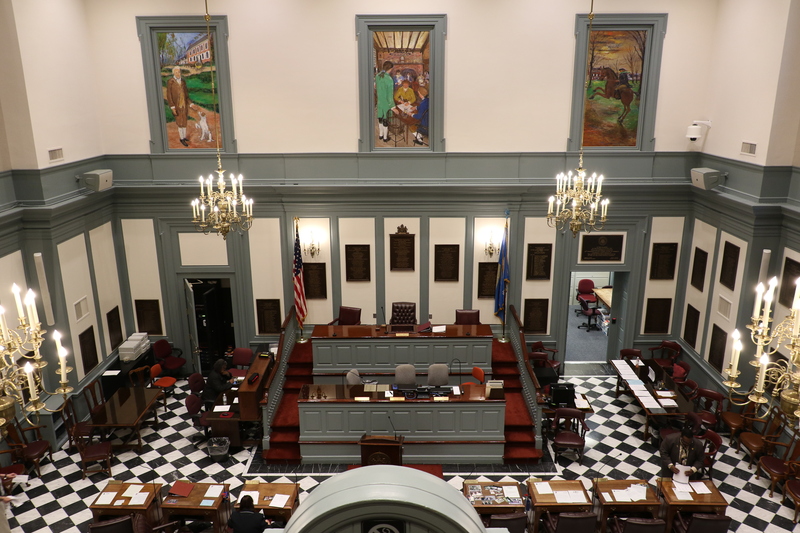 SB5, which would repeal Delaware’s anti-abortion laws that are currently on the books but are unenforceable and void due to the U.S. Supreme Court’s ruling in Roe v. Wade. If Roe v. Wade were ever to be overturned, these anti-abortion laws would again be active and enforceable. The bill passed the Senate 11-7 with 1 absent and 2 not voting. AN ACT TO AMEND TITLE 24 OF THE DELAWARE CODE CODIFYING U.S. SUPREME COURT PRECEDENT RELATING TO THE TERMINATION OF PREGNANCY. HISTORY: Passed the Senate 11-7-1-2. DD, can you name names? I will name the name once I have it officially confirmed that this Representative is either noncommital or a no on the bill. I will tell you, it is a shocking and stunning name. I believe we know the same name DD and it is shocking. Even more so that I’ve heard that the waffling is being defended by this person with “just wait and see what I do on the floor”. All Dem street cred revoked if true. That is not the response of a principled progressive that this person claims so self righteously to be. Damn right it’s not. Again, if true, I sincerely hope there’s a real friggin good reason for the uncertainty. At this point, even if this person votes yes, they can no longer be trusted as a principled progressive ally. We are talking about a bedrock principle here: Pro-Choice. If you cannot be trusted on this, if you subject us to wait and see games, then you are not an ally. In other words, the damage may already be done. It is someone you know quite well. Hi gang. I’m generally very appreciative of what you do. I find the posts here to be informative and they often drive me to action. This post is an exception. If you don’t have this information officially confirmed and you’re not naming names, what is the point? The comments thus far seem to be from people who are “in the know” and if you want to discuss this situation among yourselves you can do so privately. I know, it’s easy for me to criticize as I don’t contribute a modicum of what you do by maintaining this blog, but I hope you will give my feedback some thought and ask what you have accomplished with this post. This is a GREAT observation. I expect that this individual likely reads this blog but am not sure what gets accomplished by not naming names. I will name the name if further conversations are not successful. Understood. Let me explain my reasoning. First, I did not want to name the name because to do would place this representative on the defensive, and I wanted other lobbying efforts and conversations that are talking place to work. Second, at the same time, I think a message did need to be sent that the Democratic base considers a yes vote as non-negotiable if this representative is to continue as a Democrat. I can tell you, without revealing much, that this post has accomplished further conversation and discussion among those who need to be having that conversation. I understand and appreciate your feedback, John. I hope you understand my reasoning. Thank you for the reply. I understand the public pressure of this post could be helpful in moving the discussion forward. Amazing…there are fewer leaks from this blog than the White House, and I read the whole damned comment thread, too. If that means this Representative is now a yes vote then this post served it’s purpose. And I won’t apologize for it. This post exists because this Representative told a lot of people that they would not commit to being a yes vote. And since this Representative holds themself out as a principled progressive, that is a stunning betrayal in and of itself. Stop with your “stunning betrayal” stuff, I know the story behind this. Once again, did you ever actually ask the state rep? No, you relied on others doing the talking. And I suppose it was more convenient for you to go with the gossip than actually reach out. It’s easy to fall into that trap when you have an axe to grind. Gossip is the process of giving details about a person that is not confirmed to be true. At no time did DD give out details about this person, nor did he allude that he has hard and fast evidence. He simply stated his opinion, as is his right. This is a blog, not the Washington Post, or New York Times. If the above referenced representative took offense, then it was not gossip, but statement of fact. As far as an axe to grind, I have seen no indication that DD has anything against this representative from his comments above, unless as he stated, this turns out to be true. In which case, he will have plenty of company. Wait, Kevin, are you saying that a progressive rep said, “You’ll have to wait to see how I VOTE on the floor” in regards to a repealing anti-abortion laws? Why the grandstanding? How does that help? Is the the “big reveal” supposed to get them support, or prove some kind of point? Once again, and I will not go into ALL the details, there was a lengthy conversation preceding that, with a fair bit of back and forth. Let’s not make this into something it clearly is not. Like I said in my reply to Hyberbolic Dem’s comment, where this information is coming from is infinitely more concerning than the actual blog post which is based on ONE person talking who clearly doesn’t seem to understand the basic nature of their job. The rep was ALWAYS a yes. And the person who spread this around knows that. That is the true story and WHO that person is that should be raising eyebrows. Kevin, can you please answer my question? Are you saying that a progressive rep said, “You’ll have to wait to see how I VOTE on the floor” in regards to a repealing anti-abortion laws? I see nowhere where DD divulged details about this Rep.’s identity. Your assumption is that one person gave this information. I can tell you that I have heard the same thing from several people, but cannot confirm that these are the same “sources” that spoke to DD. Also, sources and articles allude to this being a news story. This is a blog post on a liberal blog. It is, by nature, opinion. This is not a news source revealing a deep state leak. You can hear multiple things from multiple people based on ONE person starting that chain of events. Look at that person and you can see why there should be a HUGE, HUGE, HUGE red flag right there. You are making bold assumptions now, based on what you want to believe. I cannot say whether I heard this from the same people as DD, but I can be sure that they formulated their own opinions based on what the believe to be true, not hearsay from some hypnotically persuasive subversive, as you attest. No, I am basing this on actually speaking to the state rep you presume to know what they are thinking and getting the facts straight. There would be no formulating of opinions if one person didn’t decide to do exactly what they should NOT be doing. To reiterate, this rep was ALWAYS a yes vote. Never a question of that. Again, that is your opinion based on your conversation with this rep. What they told you may not be what they told others (plural). It is not too far fetched for a politician to cover themselves by telling you one thing to “correct the record,” that may be different from what they told someone else/others before. I get into disagreements with this rep all the time over policy and issues. Many think we agree on everything and that is not the case. But I do have a tremendous amount of respect for this rep and I know this rep has more integrity than most of the people in Legislative Hall. I trust this rep and know that they will be straightforward and honest with me. It is also not too far-fetched that others in the political arena will create issues that aren’t there for their own benefit or twist words for their own reasons. I’m not writing about this on my blog, because I predominantly cover education along with some matters pertaining to education in some way. So there is “no record” to correct with me and the rep knows that. I will leave it at that. One more time… Kevin, can you please answer my question? Are you saying that a progressive rep said, “You’ll have to wait to see how I VOTE on the floor” in regards to a repealing anti-abortion laws? I haven’t made any derogatory comments, Kevin. I have repeatedly asked that you clarify what you wrote… because, as I read your comment it actually confirms what DD wrote initially. But I guess asking you to explain your words is ugly politics. No, I wrote only one part of a conversation. To be honest, this rep was getting a significant amount of pressure trying to clarify something with the bill. Attempting to understanding something does not equate to being against a bill. I would love it if ALL legislators questioned bills even if they agree with them so they understand exactly what they are voting for. But the way this has transformed and morphed into this bizarre witch hunt is weird. It’s like when you do that circle thing where someone starts by whispering something into someone’s ear. Under listening theory, by the time it gets back around to the person who started it, it is completely different. When someone (who should know better) decides to say what they want even though they know what was whispered into their ear, that is something different. So of course by the time it comes back around it will be distorted beyond belief. This kind of thing is more of a reason we have a President Trump than anything else. Someone called a third party to find out how the rep was voting on the bill instead of directly contacting the rep. So you can classify this under the vein of “don’t go through other people, just ask me yourself” as to the nature of the comment. I hope this ends this ridiculousness and it is put to bed. There is NO story here, no progressive dem all of a sudden abandoning the ship. It is a play on words where it originated from third party conversations, relayed to the author through third party conversations, and further enflamed by third party conversations. If any of you wanted to know this, I would have contacted the rep before relying on third party conversations. ‘Nuff said.